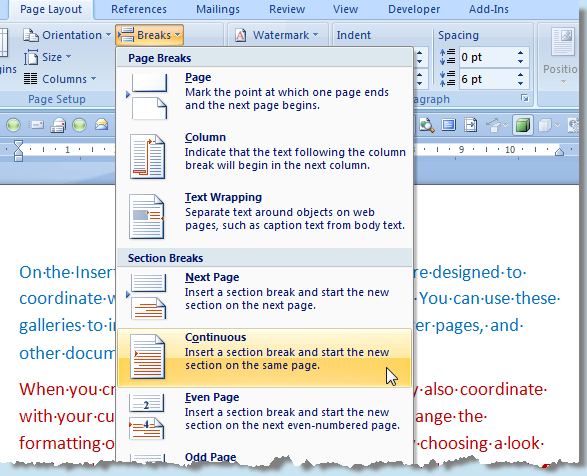 This page presents an example of the different behaviours exhibited by Word when deleting a self-contained Section Break, one not part of another paragraph. It has been separated out in order not to get in the way of the thrust of the main article. This example is done in Word 2007, but the same effect appears in all Word versions. 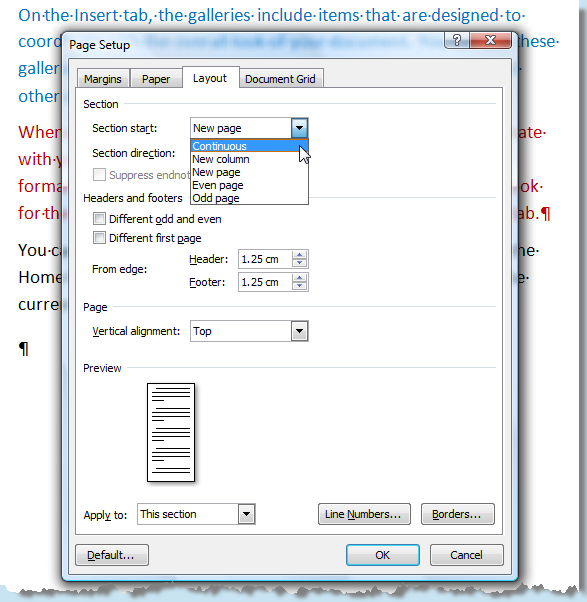 It is presented – in Print Layout View – in some detail in the hope that it is absolutely clear what is being done. All the screenshots presented here have “Show All” (Ctrl+* is the easiest way to toggle this setting) in effect so that Paragraph Marks and Section Breaks are always visible. 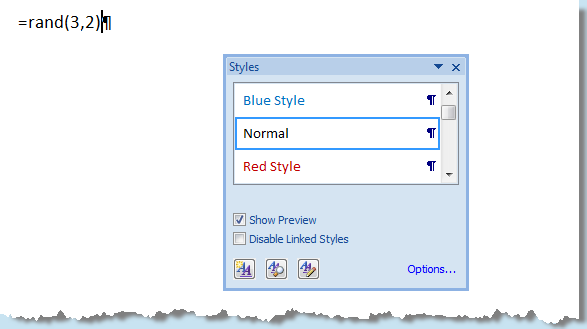 First, open a New Document; then create two New Styles, one called “Blue Style” and one called “Red Style“, and colour them appropriately; I have based mine on Body Text. The purpose of these is simply to have two visually distinct Styles, and other settings are not of great consequence. 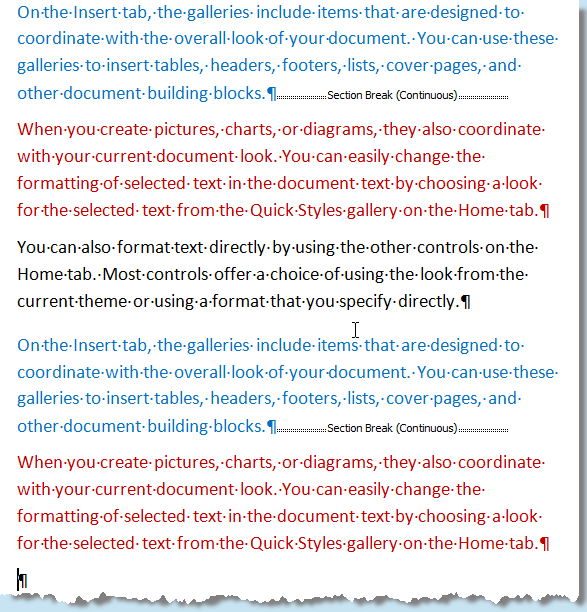 Set the Style of the first paragraph to Blue Style. 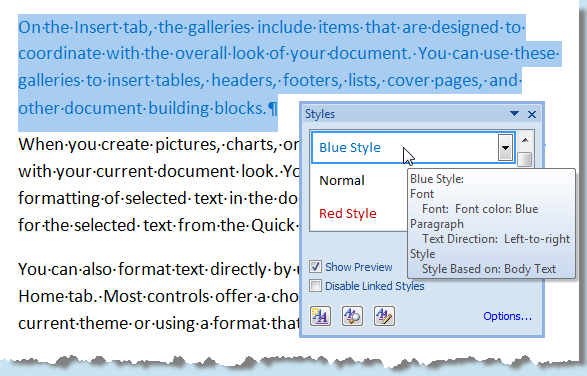 Set the Style of the second paragraph to Red Style, and then position the cursor at the end of the blue paragraph. .. and insert a Section Break. Next, delete the paragraph mark after the Section Break. .. and insert one before the Section Break. The reason for doing it this way is that it is one way to make sure that the Section Break is in Blue Style, as you can see below. This example is slightly artificial, designed to highlight a particular problem. On most occasions you probably have two paragraphs of the same Style and the Section Break will naturally inherit that Style. On most occasions, too, the Style of the Section Break is of no consequence as it does not affect the display of the Section Break or any of the surrounding text. 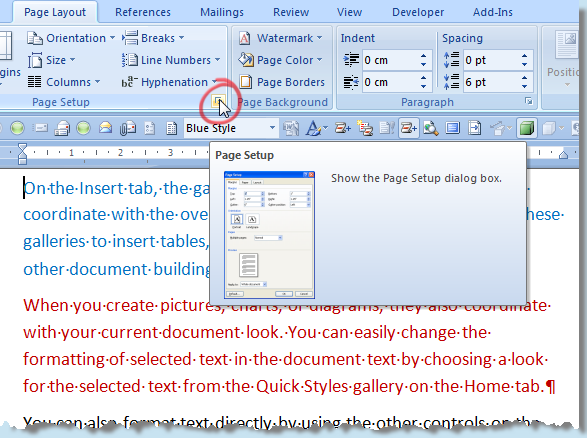 When you have launched the dialogue, select the Layout tab and change the Section Start from “New Page” to “Continuous”. Now you are ready to begin. 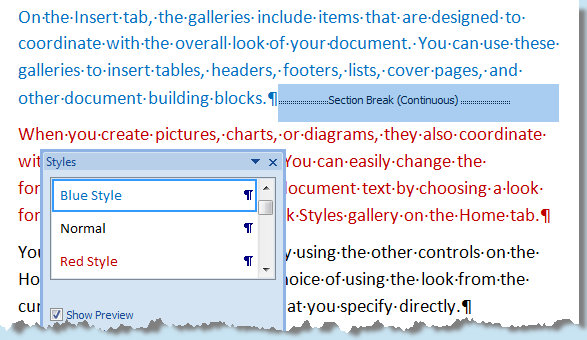 Firstly, to see what should, and usually does, happen, select the Section Break and press Delete. You have deleted an entire paragraph. 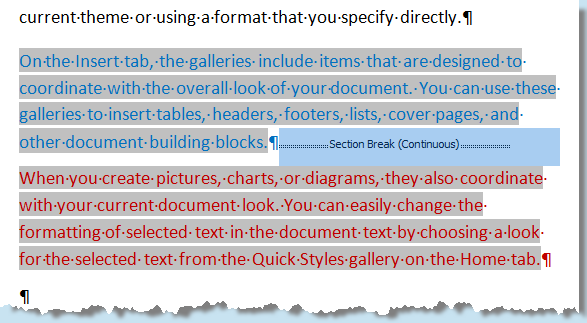 For the purposes of this demonstration, Section attributes are not relevant and the fact that the paragraph contained a Section Break is incidental. You can clearly see that no changes have hit the surrounding paragraphs. Now that you have seen this remarkably uninteresting event, undo the deletion. 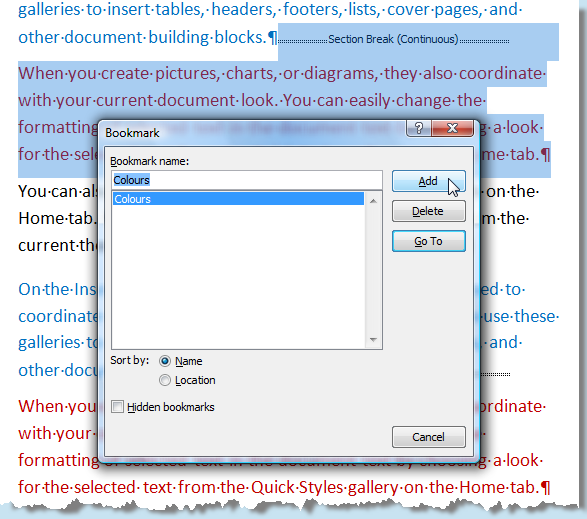 Next, Select the blue paragraph, the Section Break, and the red paragraph and Insert a Bookmark; I have called mine “Colours”. Now select the second Section Break. Assuming you have Field Shading switched on, you will see that it, and the two paragraphs bounding it, are shaded, showing that they are all part of a Field. .. and you will, once again, see nothing unusual. Deleting a Section Break inside a Field result has the same (correct) effect as deleting one outside a Field. Undo the deletion. 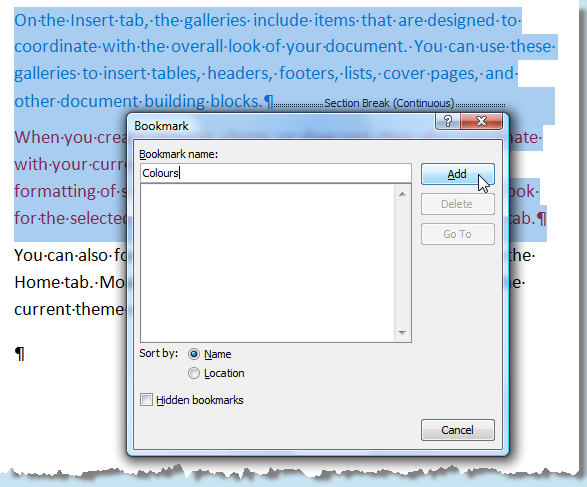 Now Select the first Section Break and the red paragraph following it and, as earlier, Insert a Bookmark. This time, when you invoke the dialogue, the existing bookmark will already be there and all you have to do to redefine it is click on “Add”. 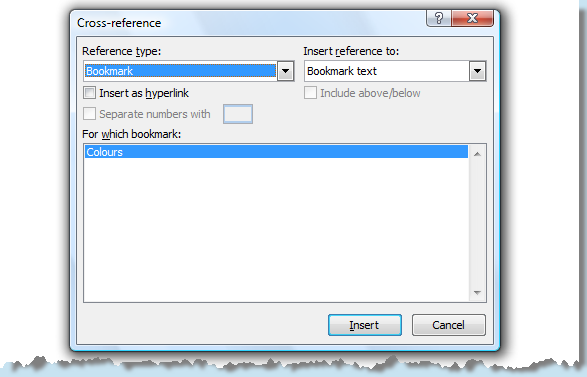 Having changed the bookmark, to see the impact you must update the cross-reference Field. Right-click anywhere in the Field; it will shade to let you know you’ve done so and a Field-specific context menu will pop-up. Click on “Update Field”. Abracadabra! The blue paragraph, and the Section Break have vanished. When you updated the bookmark, you did include the Section break, didn’t you? Of course, you did and, if you switch to Draft View you will see that it is still there. It is not, however, necessary to switch to another view to perform the next trick and, in some ways, it is more dramatic done from Print Layout View. Position the insertion point just before the paragraph mark at the end of the black paragraph before the (red) Field. Press the right arrow once. The cursor, the insertion point, will vanish. Before you start to imagine that you have somehow relocated to the Bermuda Triangle, note the shading that indicates that you are now inside the Field. The cursor is, actually, in front of the (invisible) Section Break. 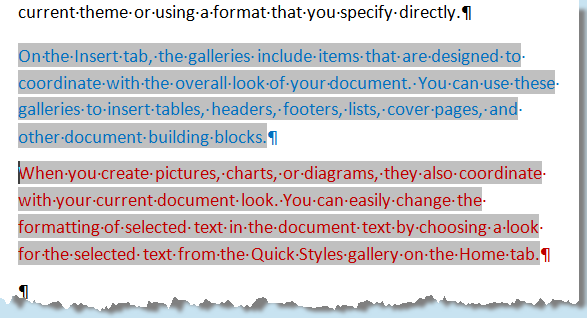 Your red paragraph (in Red Style) is now a blue paragraph (in Blue Style). The good news is that your insertion point has re-appeared. When you delete a Section Break at the start of a Field result, it does not just quietly disappear as it does when deleted from almost anywhere else; I say ‘almost’ because the problem is not quite limited to the first paragraph of a Field result but it serves as a good example. The effect is as though the implicit Paragraph Mark within the Section Break is deleted first, leaving an orphaned Section Break merged with the following paragraph, which now, having been merged with the previous paragraph, takes its Style from the previous paragraph (remember that you took care to ensure that the Section Break was in Blue Style for this demonstration). After the apparent merging of the two paragraphs the assumed following removal of the Section Break has no further effects on the Paragraphs. That is how it appears; what actually happens is, of course, top secret. That’s it! Return whence you came.Return whence you came. 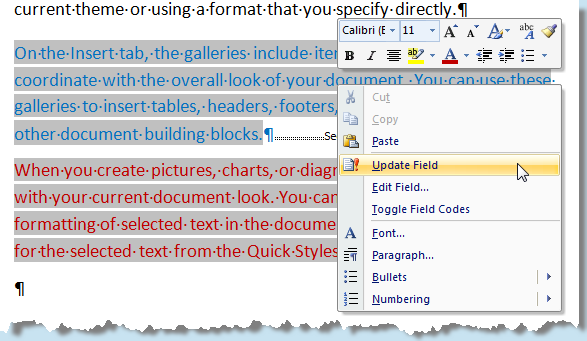 [link to back to Paragraph Issues at IndexUpdate.php#ParagraphIssues]. Tony Jollans. This page last updated: 25 March 2011.